"With this flag flying...I will go!" Captain Phantom F. Harlock is the good-intentioned man with the bad rap. His name has become as much a tradition of the Harlock family as the scar on his face, a tradition that goes back many generations to the original Phantom F. Harlock, a biplane pilot in the early 20th century. His story has been as stormy as his present. He had once commanded an earth ship, the Deathshadow, but he was defeated by the invading Ilumidus Empire and forced to surrender. Framed and threatened, his travels would eventually lead him to the Voice of Free Arcadia, where he would find new friends and a new mission. Thus, he became the Captain Harlock of fame. 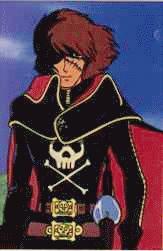 Harlock is a very serious-looking man, and his scarred face, patched eye, and pirate's outfit can be very deceiving. He truly is a very just man who does what he does for the good of all. His methods are usually quite direct and avoid the loss of life if possible. He also has an eye for someone with a good heart and good intentions like he. On a side note, the character Captain Harlock has a very deep past going as far back as the 60's, perhaps even farther. Cameos and similar characters appeared then, and all of the pieces from these previous roles were eventually put together to create the Captain Harlock as seen in the universe that encompasses the series seen above.